I went away on a trip at the weekend, to visit Lancaster. Lancaster is a city about 100 miles away from my home, and it happens to be where I attended University. I was a founding member and former chair of the games club there, and still hold the role as secretary. I visited Lancaster in this capacity as it was our AGM. I am not going to talk about that. I will recount a couple of things that happened. The trip south of the border took a couple of hours and was basically uneventful. I got to Lancaster and checked into the hotel. My accessible room was almost as far away from the lift as it is physically possible to be. This is not the first time that has been the case. I have a slight mobility impairment. Nothing major, but navigating a bath not properly prepared for me with rails and whatnot is difficult if not dangerous. So, on every booking I indicate I have mobility issues. I always get an accessible shower, but bizarrely it is farthest away from the lift. This happens in every hotel. I wonder if someone at one point created this policy somewhere assuming everyone with mobility impairment, of whatever level, meant wheelchair. I should probably be offended, but the fact of the matter is I can walk and the shower functions as intended. The first adventure happened when I got into the lift and asked for the top floor. Something is missing from this picture. He looked less interested in my grown up Enid Blyton-esque adventure than I was, so I contented myself in the knowledge that I could find the hidden floor anytime I wanted. I was reasonably sure what I found would not be the same as the aforementioned Babylon 5 episode, as that would require a weird death cult lead by Robert Englund and a carnivorous alien – which I deemed highly unlikely, as housing a carnivorous predatory alien would run contrary to the best practice of the Holiday Inn. I got to my room and inspected it. Then I inspected the other room. Ok. Perhaps there is a perfectly valid reason my toilet is square. Perhaps it keeps manufacturing costs down, perhaps it is deemed by the powers that be to be easier to clean. All I know is that after years, nay decades, of practice my posterior is accustomed to a circular seat and conforms to that shape. I can only think of one person whose buttocks might conform to this toilet. Mr Strong, of the Mr Men. Though if memory serves, based on his diet as outlined in the book, he’d probably be more concerned about size of the bowl than shape. I attended my AGM. It was uneventful. It was then time for games. First it was Betrayal at the House on the Hill. The heroes won. I have to say, the house we built was weird shaped, with the ground floor significantly smaller than the upper floor. That had literally no impact on the game, I just had trouble accepting it. I went to the game supply and found Star Wars Rebellion. The club has owned this game for over a year now, ever since we beat two other Universities at a Games tournament and I have been wanting to play it for just a long. I have to say, I am pleased to report that we thrashed our opponents, which was good as I genuinely didn’t think we were quite so competitive, and secondly I am pleased to report I suggested Rebellion as prize, just in case we won. I played as Empire, naturally. After playing it once, I have to say that Rebellion is a simplified version of the game “Twilight Imperium”, with fewer rules and the ability (actually, the near necessity) to play with only two players. The limit on players and relative complexity, despite simplification (It is a fantasy flight game, simplified is relative), is probably why it is rarely played at club. It was a lot of fun. 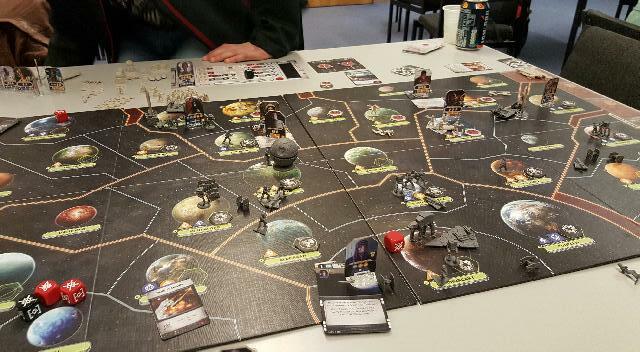 Players start with 4 leaders, 6 missions and a number of systems under their control. The game is played in rounds, where players assign some of their leaders to missions (Which could be construction, diplomacy, espionage or sabotage) and then use the rest to move fleets and defend against attack. The simplicity makes this a quicker play than Twilight Imperium, and it has the added advantage of being steeped in Star Wars stuff. Twilight Imperium has more things you can do, a stronger emphasis on exploration, RnD and (believe it or not) Politics. I believe, had I the spare £75 I could justify owning this (I already own TI). Sadly, I cannot justify the expense so it remains an elusive dream. I never found the rebel base before we had to call it quits. However, I was able to crush the main Rebel Fleet and their primary shipyards, so the tide had turned in my favour. But, as the game halted turn 4, I guess we’ll never know. I helped tidy up and bid my friends good night and returned to my hotel room. On the way, I decided this would make excellent material for a blog related to gaming but a bit more than simply review. I resolved to write it immediately despite it being midnight. As they say, this is not my first rodeo. Though the last time I felt compelled to blog at midnight, it was to write a Scooby Do fan Fiction based on the punchline”I would have gotten away with it if it weren’t for you eskimo kids”. I do not believe I still have that manuscript. Perhaps it is for the best.